The Fokker S.13 Universal Trainer is a dual engine propellor aircraft for training purposes designed and manufactured by the former Dutch aircraft manufacturer Fokker. In the early years after World War II, Fokker was resurrected with help from the national institute for aircraft development, the Nederlands Instituut voor Vliegtuigontwikkeling (NIV). Fokker expected strong demand for training aircraft, and therefore a range of designs was worked out. One of those became known as the S.13. This model, dubbed Universal Trainer, was meant to be trainer for multiple engine training, navigation training, paradropping training and training in radiotelephony. The prototype with registration PH-NEI made its maiden flight in 1949. The aircraft proved to be easy handling and strong. Flight testing was successful and the Dutch armed forces intended to buy the aircraft. 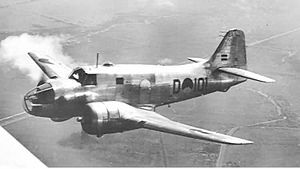 Shortly before deciding upon procurement, the Dutch armed forces were provided with Beechcraft Model 18s under the Mutual Defense Assistance Pact (MDAP), almost for free. As other parties did not show interest in the S.13, Fokker terminated the programme. The only existing S.13 was transferred to the NIV in 1953. Years afterwards, the airframe was donated to the aerospace faculty of the TH Delft, today known as Delft University of Technology. Although the Dutch armed forces never took the S.13 into service, Fokker operated the S.13 prototype in military livery. Therefore the S.13 has flown as D-101. During the severe floodings of February 1953, the D-101 was used for photoreconnaissance from naval air station Valkenburg. There are some S.13-relics in existence today. The cockpit section is displayed in the Aeronautical & War Museum at Texel Airport. The tailsection is owned by Aviodrome aviation museum, but currently it is not on display. Bridgman, Leonard (ed.) (1953). Jane's All The World's Aircraft 1953-54. London: Jane's.